This chapter book is wonderful for mischievous kids and the ones who always follow the rules. How can a book be for both types of kids? 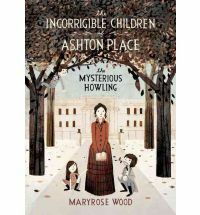 In The Incorrigible Children of Ashton Place: the mysterious howling, we meet Penelope Lumley who has just graduated from the Swanburne Academy for Poor Bright Females. She is 15 years old and is going to an interview to be a nanny for 3 children. She doesn't find out anything about the children until after she accepts the job. The three children were raised by wolves! Miss Lumley has to go out to the barn to meet them, where Lady Constance and Lord Fredrick have been keeping them. As we keep reading the book, we get to know Miss Lumley and the three children. She works very hard at getting them to behave like normal little kids, all leading up to the big Christmas party Lady Constance is throwing. It seems like someone in the house wants these three children gone though. Who could it be? Who is trying to get rid of them? This must be the beginning of a series of books too, because the ending isn't totally clear. What will happen to the children? Where was Lord Fredrick during the party? And is there someone living behind the wall in the attic? We'll have to keep reading the next book to find out!